The rivers of Kamloops collect the meltwaters of mountain ranges of the Interior, flowing downstream where they meet to become the Thompson River. The South Thompson River comes from the Monashee Mountains to the east, collected in Shuswap Lake, then it flows 60 km west to Kamloops. The North Thompson River starts in the Cariboo Mountains to the north and flows for 355 km south to Kamloops. The confluence is right in the center of Kamloops. The Thompson River flows for another 15 km to Kamloops Lake and then beyond to Ashcroft, Spence’s Bridge and to Lytton where it joins the Fraser River. 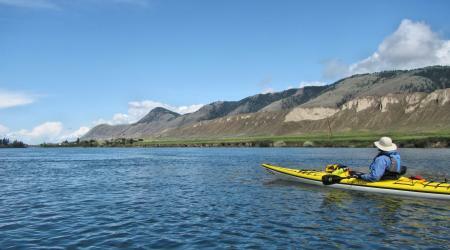 The rivers of Kamloops offer a combined total of over 100 km of recreation opportunities for on-the-water activities. 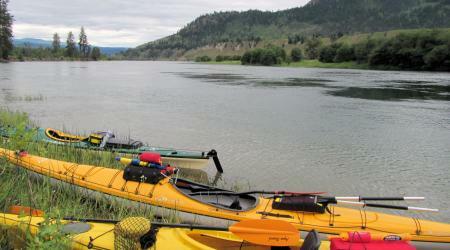 Paddlers can launch their boats at a number of spots along the South Thompson River. The best launch spot is at Pioneer Park where there is lots of parking, a boat launch area with beach landing spots, a back eddy start/finish, and choices of upstream or downstream paddling. A popular choice is to go upstream to the Yellowhead Bridge with an easy paddle back downstream for a 3.5 km out-and-back route. Paddlers can also go downstream to the confluence of the two rivers and back, staying close to the shoreline in either direction. Upstream paddling is all hard work, so it’s always best to stay close to the shoreline. Other launch/landing spots on the South Thompson River include Valleyview Boat Launch, the Lafarge Bridge (21 km upstream), the Pritchard Bridge (42 km upstream), and at Chase. An excellent choice is to paddle downstream only, leaving a vehicle at the landing spot. Downstream paddlers can expect to do 5 to 8 km an hour! There are a few spots to hand launch on the North Thompson River. Paddlers can go upstream from Riverside Park which will be a good workout since the North Thompson River flows more quickly than the South Thompson River. There are a few spots along the river to launch in Westsyde with the best choice being the foot of Harrington Drive. It is possible to launch from Rayleigh, the Tournament Capital Ranch too, but there are no official boat launches. Farther upstream, paddlers launch at the McLure Ferry and the Little Fort Ferry for long downstream paddle adventures. Paddlers can also launch from McArthur Island to explore Rabbit Island, the 12 km section downstream, or upstream to the confluence. At Cooney Bay the river empties into Kamloops Lake and paddlers can explore the shoreline west to Battle Bluff or along the east end of the 25 km lake. During freshet, the estuary floods and paddlers can explore the Tranquille Wildlife Protected Area wetlands. All boats should carry safety gear (a pfd is essential) and paddlers need to take precautions for weather conditions, faster flowing water during freshet, river hazards, fitness considerations, cold water, other and paddling safety considerations. The best time to paddle the rivers of Kamloops are mornings, weekdays, or the off-season when the powerboats are not out in force. At those peak times, paddlers can go to one of hundreds of lakes in the area, picking a new location each time all season!